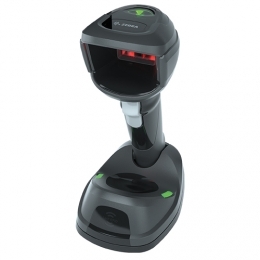 One-of-a-kind hybrid UHF RFID and 1D, 2D and Digimarc barcodes design provides maximum flexibility, offering both handheld and hands-free cordless barcode scanning and also capturing RFID-tagged merchandise at the POS with the UHF RFID mode. Zebra are pleased to announce the release of the 1D & 2D DS9908-HD and DS9908R-HD High-Density models. codes on samples and medicine containers in laboratory environments. Scan it all with virtually no exceptions - Zebra DS9900 Series combines an 800MHz microprocessor, a high-resolution megapixel sensor and Zebra’s exclusive PRZM Intelligent Imaging technology for unparalleled performance on 1D, 2D and Digimarc® barcodes. Problematic barcodes won’t slow down your checkout lanes. The DS9900 Series can instantly capture dense, poorly printed, damaged, crinkled, faded, distorted, low-contrast, and glossy printed barcodes, as well as electronic barcodes on dimly lit mobile phone displays. With the widest field of view in its class and an advanced illumination system, the DS9900 Series provides the near instant barcode capture you need to keep the busiest checkout lines moving. You get one of the industry’s top first-pass read rates — up to 240 in./610 cm per second. A large field of view makes presentation scanning easier than ever, enabling associates to focus on your shoppers rather than positioning items. If you are already benefiting from RFID in your supply chain, you can close the RFID loop by capturing RFID-tagged merchandise at the POS with the RFID model. Checkouts are easier than ever, since associates can scan multiple items at once without line of sight. Capturing RFID tags provides the real-time inventory visibility needed for timely re-ordering and trending analysis. The reader operates with just 5 VDC and does not require an external power supply. And complimentary RFID data conversion software lets you read RFID tags without modifying your existing POS application. Dynamic switching between hands-free and handheld modesA patent-pending capacitive touch sensor and accelerometer work together to instantly switch to handheld mode as soon as an associate picks up the scanner. There are no mechanical components to wear out, providing fail-proof switching throughout the scanner’s life. The ergonomic handle is comfortably weighted and balanced, remarkably easy to pick up and aim in handheld mode. In presentation mode, the integrated adjustable stand offers a sturdy, compact solution that fits into space-constrained areas and frees up more space for impulse buys. Handheld and presentation modes have different requirements for scanning. That’s why the DS9900 Series is purpose built for both modes. In presentation mode, the scan range is limited to prevent unintentional scanning of nearby items. In handheld mode, the scan range is extended up to 24 in./62 cm to easily reach items in the cart.